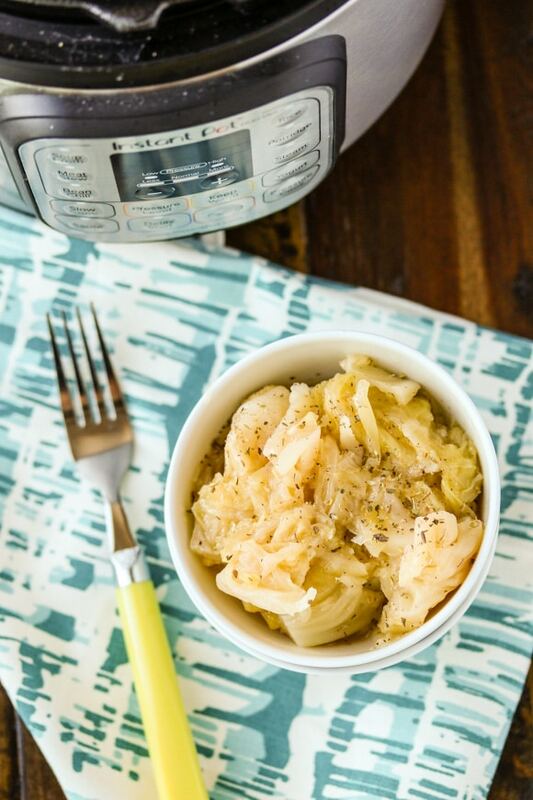 When you’re trying to get dinner on the table and need an easy vegetable side dish, this Pressure Cooker Instant Pot Cooked Cabbage recipe will do the trick! 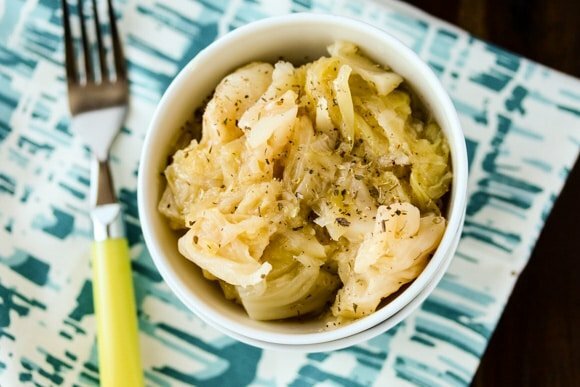 Cooked Cabbage is So Easy to Make, and Delicious! If you haven’t eaten cooked cabbage in awhile, it’s time to bring this vegetable back into rotation. Despite how pungent cabbage can smell, it’s actually fairly mild in flavor once it’s cooked down. Really, I promise! And, the pressure cooker (I recommend a 6-quart or 8-quart Instant Pot) is the absolute perfect appliance for cooking cabbage fast. I’m a super taster and so vegetables often taste bad to my sensitive tastebuds, but I was surprised how much I liked this cooked cabbage, especially as a side dish to cooked ground meat, a roast, or sausage. Or, for a fully plant-based meal, this cooked cabbage could be served with seasoned black beans or tempeh. The only seasoning I added to the cabbage was some dried oregano and thyme, although the broth added some extra flavor as well (feel free to use whatever kind of broth you like or have on hand). All you have to do for this recipe is roughly chop one head of cabbage, green or red, and add it to the pot with one cup of vegetable or bone broth (heck, you can use water if that’s all ya’ got), and one teaspoon each of dried oregano and thyme (pick one over the other to keep it to only three ingredients). Feel free to add salt and pepper, to taste. Bring your Instant Pot pressure cooker to high pressure for 7 minutes and either quick-release or let the pressure come down naturally. Serve hot and refrigerate or freeze any leftovers. Roughly chop one whole green or red cabbage. Add the chopped cabbage plus the dried herbs to the pressure cooker base (you can use dried thyme, dried oregano, or your favorite dried herb). Add one cup of water or broth and lock on the lid. Cook for 7 minutes and use the quick-release or natural-release method. Serve the cabbage as a side dish to your favorite meal. 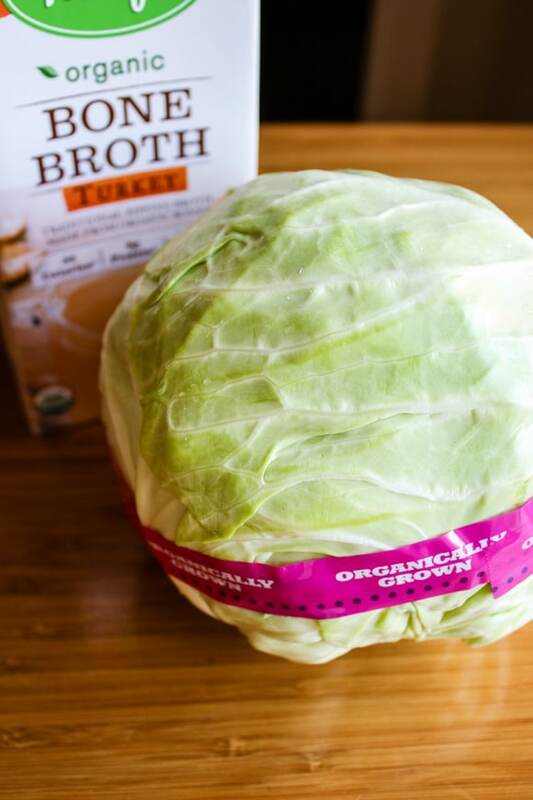 Here’s a how-to food video for how to make cabbage in the Instant Pot pressure cooker! Can I use a 6-quart pressure cooker for this cooked cabbage recipe? Yes, but remember to never fill the bowl over the “max” line. What is the total time from start to finish for this recipe? The cooking time is only 7 minutes, but you do need to allow at least 8-10 minutes for the pot to come up to pressure. So, from start to finish, it takes about 20 minutes to cook cabbage in a pressure cooker. Can I steam cabbage in a pressure cooker? Well, that’s kind of what happens here, but you’ll need to use the stainless steel insert to keep the cabbage from touching the liquid. I don’t recommend this method. Follow my recipe below instead for better results. Can I use water instead of broth? Yes, but your cooked cabbage made in the pressure cooker will have a lot more flavor if you use broth. Can I make this recipe vegan? Yes, just use vegetable broth instead of bone broth. Will this cooked cabbage recipe make my kitchen stink? You likely won’t smell the cabbage cooking, but you will get the odor of cooked cabbage when you release the pressure and/or open the lid. Can I cook the cabbage for less time to leave it with a firmer texture? Yes! I would recommend cutting the time at pressure to 3-4 minutes for a firmer texture to your cooked cabbage. Could I pressure cook a whole cabbage without chopping it? Yes, I’m sure you can! But, I haven’t tried it and chopping the cabbage at least into wedges will ensure that it gets cooked through. An easy vegetable side dish made in the pressure cooker. Combine the cabbage, herbs, broth, and salt and pepper to the bowl of an 6-quart or 8-quart electric pressure cooker. Lock the lid and bring to high pressure. Cook for 7 minutes and quick-release or let the pressure come down naturally. Serve hot and refrigerate or freeze any leftovers. To keep the recipe to only three ingredients, choose one of the dried herbs. Salt and pepper are to taste. Pin this easy cabbage recipe to your Pinterest Instant Pot board to save it! I often make coleslaw or sauerkraut, but I’ve never served cooked cabbage as a side dish on it’s own. I must try this! love it! so easy and we love budget saving cabbage around here! What a simple, nourishing vegetable! I am such a fan of cabbage and I have no idea why I’ve never used a pressure cooker before for it! Love the simple seasonings you went with too! Cabbage is one those underrated vegetables that are so delicious when prepared right. Thanks for a great recipe! Yum! Sounds great. I make cole slaw frequently and always wonder what to do with that leftover cabbage…now I know! Ha, thank you! I haven’t made cabbage like this yet in my IP. I’ll totally use your recipe! Thanks, Megan! 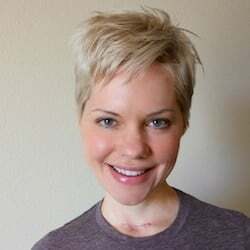 BTW, I love your recipes, I got turned onto your blog after seeing you in the WAPF Journal. You are amazing!!! XOXO. Pressure cookers are awesome. What a quick way to make a delicious side dish any night of the week. Love this quick and easy recipe for cabbage, which is one of the staples of my diet. What a great idea! I hardly ever just eat cabbage like this, but it is so good! I totally should eat it more often. Yum! I love cabbage and your pressure cooker cabbage looks quick, easy and delicious!! I”ve never seen turkey bone broth. I can’t wait to get some! Great recipe Carrie! I love cabbage!! it is one of my favorite quick sides to prepare, but I never thought to do it in my IP, thank you for a great idea! i dont buy or eat cabbage as often but now im inspired to give it a try! thank you for this idea. Awesome! I use bone broth to cook vegetables all the time, traditional wisdom for the win 🙂 I can totally see the benefit of cooking cabbage in a pressure cooker that would have taken a ton of time otherwise. I really love making cabbage as a side dish but often don’t leave myself enough time – this pressure cooker version is a great idea! I’m always looking for ideas to cook cabbage, especially in winter when cabbage is sometimes all I find at the local organic farm. This is such a great and easy recipe. I love this! Cabbage is one of my husband’s favorites and I’m a sucker for the IP. Totally easy and such a great side dish! Such simple and delicious recipe! This would work wonderfully for Friday night! Cabbage is so good anytime and I love this quick recipe that only requires a few ingredients. Thanks so much for this recipe! 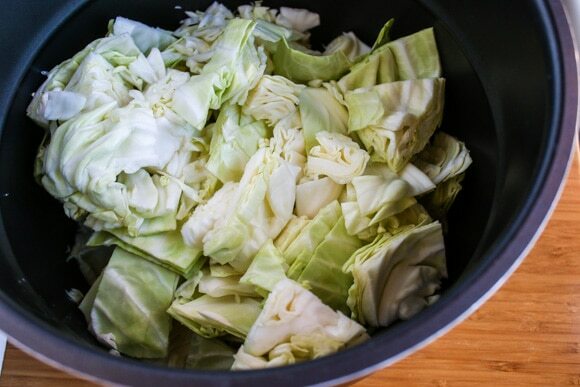 My husband is a HUGE fan of cabbage but I never thought to make it in a pressure cooker! I’m so making this recipe! just printed it out! He’s going to be so excited! Thanks for posting! Oh, my fiance will looove it! I got my Instant Pot a few months ago and love it! Never tried to make cabbage, but what am I waiting for? Looks great! We really like cabbage but I never think to cook it! It’s a standard in salads, coleslaw, and we use it a lot instead of the lettuce in lettuce wraps. I have bad memories of super soggy, wilty cooked cabbage as a kid, but I think it’s time to give it another chance in the Instant Pot! I’ve never seen that turkey bone broth before – I’m gonna have to keep an eye out for that! Oh yum! I think cabbage is so highly underrated, it’s truly one of my favourite veggies! You’re right about the IP being a great way to cut down on the smell – it’s so much better contained, right?! Calories 326, Fat 5.7, Fiber 25.3, Carbs 58.3, Sodium 3,399.1 and Protein. This is not a lot for a pot of cabbage, do you have any idea as to how much a serving should be so this can be used to calculate per serving? By the way, it’s great compliment for a Keto meal with lots of fat…or bacon added to the cabbage. Hi Jim, I’m not sure what question you’re asking me. I have the nutrition data in the recipe for the way I made it (just cabbage). So, do you mind re-phrasing your question? Thanks! I love that it is super easy to cook cabbage in the IP! I think for my personal taste, I would use only 1/2 tsp of each spice. If you like oregano and thyme, this recipe is fine, but I just prefer a little less. Also, I like my cabbage a little less cooked, next time I will try 6 minutes. Overall, this is a super easy and tasty recipe that I will try again! Basically a good, simple recipe, though I personally found the cabbage to be a bit overdone at 7 minutes. I think next time I’ll try 5 and see if that works better. 7 minutes is way too long for cabbage unless you want cabbage-flavored mush. Cabbage should be soft throughout the leaves, but slightly firm through the stems, this recipe makes everything way too soft. I disagree! You can see from the video that it’s not mush. But, feel free to cook it 3-4 minutes if you prefer firmer cabbage. I agree, I cooked it for 4 minutes and it was still a bit overcooked for my liking. Great taste though so I’ll try three minutes next time. yes. 7 minutes is way too long. makes it mushy. 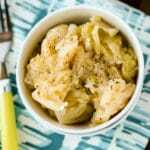 This is one of my favorite easy Instant Pot recipes! I was a bit dubious about 7 minutes so I cooked it for 4 minutes. It was still slightly overcooked for my personal liking, but had a great flavour. I cut the cabbage into thick wedges and set for 5 min. It came out very mushy so next time I’ll have to reduce the time even more. It tasted good, just not the consistency I like in cabbage.